I don't know what it is about bath toys but my daughter can play with them for hours. 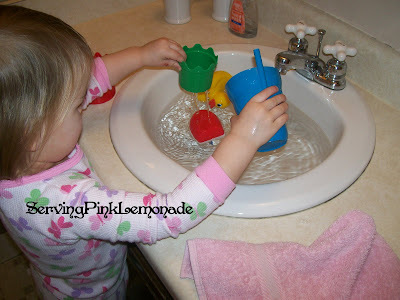 Sometimes I don't want her in the tub all day so we do sink time and play with the bath toys in the bathroom sink. For bigger fun we sometimes use the kitchen sink. And for a really messy good time we sometimes add bubble bath to the water. But no matter what we do we always keep a towel handy. William likes to play in the water too... I should do it more with him. You should try making the foam/cork animals that we made a while back. Olivia would love them! I'm planning on it as soon as I can get some cork.